What kind of MPG are you guys getting on LPG? My commute is around 20 miles each way. I have an option of going cross country with lots of windy corners, stopping, crossing main roads and accelerating back up to 60mph or taking the motorway which has 2-3 miles of stop start traffic at each end. I leave it up to the satnav to decide which route I should take on any given day as it gets traffic updates etc. I'm averaging somewhere around 14mpg on LPG. Anyone know how the pumps are assembled/disassembled? Wondering what mine looks like inside and if it can be rebuilt cheaply as a spare. The bearings and impeller look and feel absolutely fine so hopefully it's just a seal that needs replacing. At a guess the wheel the pulley bolts to is pressed or threaded on to the shaft which holds everything else in? Last year I had an intermittent book symbol and Gilbertd kindly read/cleared it for me and IIRC it was for a stuck blend flap. I now have a permanent book symbol and the passenger side vents seem intent on pumping out hot air regardless of what I set it to. I'm guessing this means the flap is now properly stuck for whatever reason. Is this something that is only fixable with a new blend motor or is it possible that it's stuck for some other reason and needs taking apart to be freed? I'm reluctant to buy a motor and not need it but at the same time I don't want to take it all apart and find I need a motor that I don't have. I have a new and interesting noise on my car. It's developed a whistling noise that changes with RPM. It sounds like it's central, somewhere behind the dash and quite high up - perhaps near the windscreen. It's not related to the air vents as it still happens with them set to the lowest speed/off. If I prod the throttle and the gearbox kicks down the noise gets louder as the RPM jumps up. If I slowly increase engine speed the noise slowly increases as well. It doesn't seem like wind noise as it's most noticeable at low speeds (before being drowned out by wind noise at higher speeds). I can try to get a video later. Air leak in the intake? Mines a Thor and given where I think the noise is I'm wondering if the "bunch of bananas" has cracked somehow. Is this something that has been known to happen? I recently replaced the little bits in the front door handles that wear out and cause them to stick/become stiff bit the passenger side one is still not quite right. My girlfriend reports that it's getting worse and nearly needs two hands. Will the handle from the passenger side rear door fit on the front door? They don't seem to wear out like the front ones and a used one should do the trick nicely if it fits. All the bolts have rusted away meaning I can't undo any of them. Having to get a little "creative (destructive) with them - bending and peeling the heatshields back. I've got all of the bolts out except the very last one on the driver's side. The one closest to the firewall, under the manifold pipes. I can't get any tools on it at all with the heatshield in place and bent as far as it will go. It's hitting the steering shaft and I'd really, really like to avoid removing that if possible. I don't think removing that will improve matters anyway as the heatshield will still be in place. I've seen that it can be accessed through the wheel arch but presumably only with the heatshield removed? If I can get to it through the wheel arch with the heatshield on and the steering shaft in place I'll go that route but access is tight for a jack where I'm parked. Don't really want to add work for myself if it's not going to work. Any other bright ideas on how to get at this bolt? I've been a bit silly. I've driven off with the filler cap on the rear bumper having forgotten to refit it. Didn't notice until three days later. Oops. Is there any reason this wouldn't fit a UK filler valve/nozzle/pipe/whatever the thing is called? Does the P38 V8 engine have unusually large valves? I bought a valve spring compressor but none of the adapters are large enough. The kits goes up to 30mm but I measured the valve spring (after finding it didn't fit) and it seems to be 31mm. Anyone know if larger adapters are available? I can't find any so far. How many PPM should a well running LPG system give for the emissions test at MOT? Replaced my front pads and discs today as one of the pads was down to the metal. All went pretty smoothly. All the slider pins were seized which I figure caused the uneven wear. Freed them of and replaced them with new pins. Went out for a test drive, did some light braking, heavier braking then tried emergency stops. I can't get the ABS to kick in AT ALL. The pedal goes down to the floor but no ABS and no locking up. Just braking but taking longer to come to a stop than I'd like or expect. 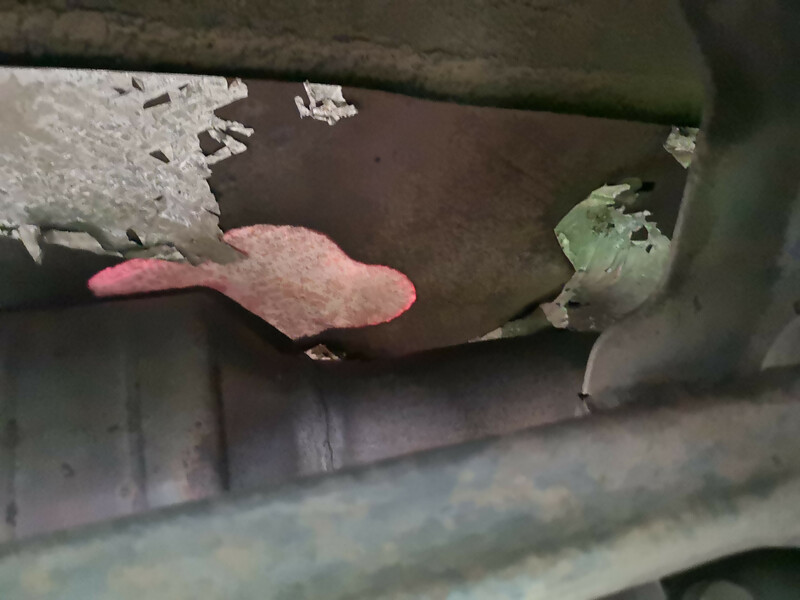 When I got home and parked up I noticed some acrid smelling smoke from the driver's side brakes (this is the one that wore down to metal). I've got no warning lights and I can't remember the last time I needed to stop hard enough for ABS so I don't know when the issue cropped up. A couple of months ago I I was getting the brake warning light coming on so I replaced the accumulator. That solved the light coming on. When I replaced it I post a small amount of fluid but the fluid was level with the top of the threads, so I assumed no air would have gotten in. Bleed the brakes and see how it is after that? Since replacing my head gaskets I've had an issue with misfiring (causing a heatshield fire), revs sticking and a high idle. 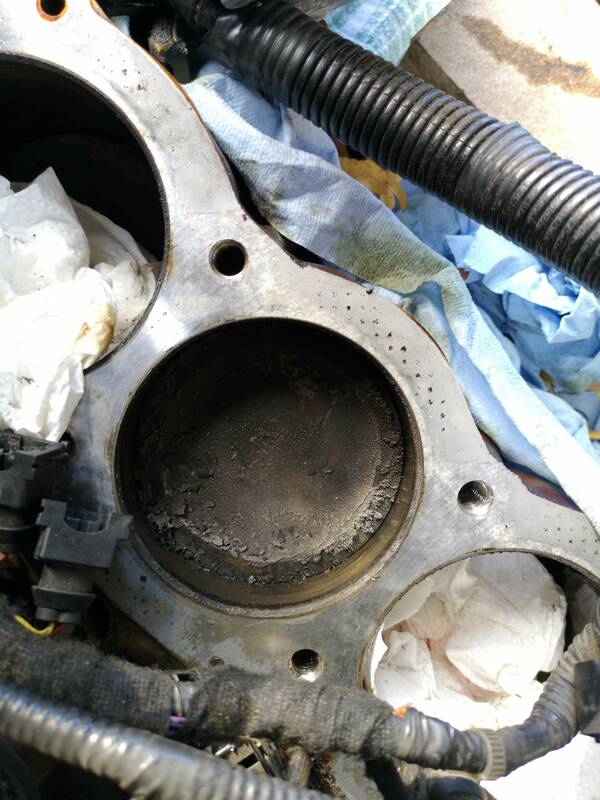 The misfire cleared itself up - I never found what was causing it as when I came back to the car to take a look it was running fine. The sticking revs was really bad straight after the rebuild. Initially they would stick/hold at whatever RPM I revved up to, occasionally continuing to rise slowly on their own. I'd have to turn the engine off to correct this. After a little while the engine would rev up and the revs would drop on their own - only to get stuck at around 2K RPM. Again, the only way I found to stop this was to turn the engine off. Sometimes the RPM would drop quickly from whatever I revved up to down to 2K where it would "snag" and then drop more slowly. When I was finally able to drive it I found that it was holding revs well enough on it's own to chug along at 30mph without needing the accelerator pedal. Not slowing down on it's own and not speeding up. Using the brakes would slow the car down and the engine revs seemed fine once I came to a stop. Now, after having it on the road for a few days the rev holding seems to have settled down and it's not sticking at any RPM but I have noticed that my idle RPM seems high. It seems to vary between 1,100RPM and 800RPM. It's not bouncing between these values, it's just sitting smoothly at different points in this range at any given time I look at it. It never gets as low as the 660RPM that RAVE says it should be. I've had a brief chat with Sloth about it as the symptoms seemed to match an old thread of his that I found online. He said he fixed his by moving the throttle cable routing. My cable seems to be routed well and as far as I can see the cable is moving freely. The throttle body seems to be closing fully when the throttle pedal is released - the cables are returning to rest against the stop properly. I tried to check the throttle body by removing the intake pipe with the engine running but the engine immediately died. I guess the sudden change in airflow was just too much for it cope with. I think my symptoms are now a bit different to his. Given that I lack a Nanocom to investigate with, can anyone suggest things for me to try to diagnose this issue? I've seen a few threads online (mostly Disco 2 related, in America) saying that they've reset the adaptive values and that's sorted high idle issues. Is this only possible with a Nanocom? I'm getting slightly bored of playing "Chase the perennial coolant leak" - whenever one leak is plugged another one pops up. I'm looking at just replacing all of the hoses in big go and hoping that stops it, at least temporarily! Looking online, almost all of the hoses seem to be Britpart and a few have Genuine Land Rover options available (at a not insignificant markup). Are hoses one of the things that are generally OK to get from Britpart? Halfway to Caernarfon and the car has started playing up. Feels like a loss of power, slow to accelerate and there's a vibration. The vibration seems to lessen when the gearbox kicks down and doesn't seem noticeable when cruising. Light acceleration gives a noticeable vibration. Revving the engine in neutral gives a slight vibration too - pointing towards engine rather than gearbox or torque converter? MPG doesn't seem affected, hovering around 18 on the motorway on LPG. There's no weird smells or smoke etc. Could someone give me a quick crash course on where to look in the Nanocom to help pinpoint the issue if there's no stored codes when I plug it in? Fresh off the back of replacing the head gaskets to fix one coolant leak and a week after a clean MOT where no coolant was leaking the car has sprung another leak! Bottom right hand side of the radiator and the pipes below that are soaked and it's leaving a large puddle under the car. Over night the level in the header tank has dropped about two inches. The thermostat appears dry in this image so I don't think it's leaking from there. The view from the top shows no leak from there and the (brand new) top hose is dry. 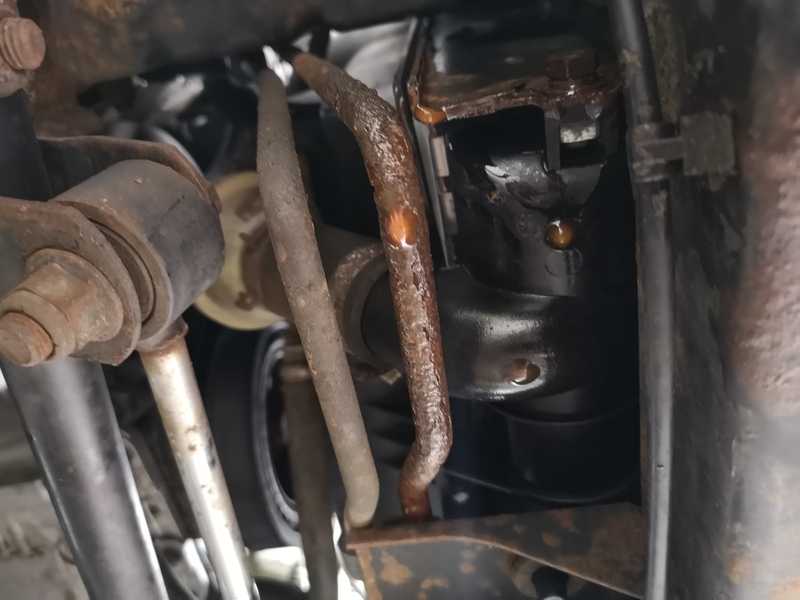 So...what lives on that side of the radiator and is located somewhere above the thermostat but below the top hose that could leak coolant? I'm getting fed up with it now! Found a new coolant leak a few days ago. The gearbox in the Freelander decided it no longer wanted a reverse gear last night. Now I think I have a power steering fluid leak! Hopefully it's just a loose union. The car ran completely fine with no roughness or smoke or any else. Just finished putting the car back together rather replacing the head gaskets, fired it up and left it to run a while to get the coolant drawn through. I'm pretty sure there's a miss fire as it's running a little lumpy but it smooths out a little when it warms up. When blipping the throttle the revs seem to cough/dip before rising. After a while a good amount of smoke started rising from the back of the engine bay. Got the fire extinguisher out and cooled it down and the smoke eventually stopped. Would a miss fire cause the cat to get hot enough to almost set fire to the heatshielding on the floor? I'm thinking the unburnt fuel from the miss fire is being pumped in to the cat where it's burning off. What's weird is that the cat itself wasn't glowing and the red patch is only at the rear of the cat rather alongside the whole cat. When it had cooled a bit I reached down to the coil and made sure all the leads were attached, they seemed ok but one or two did move in a little. I then checked the leads to the plugs and they seemed ok too. I then started the engine up but I'm not sure if it sounded better or not. I didn't let it run long. Pulled the spark plugs out (passenger side) and looked at them. I'm not sure of the cylinder numbers but I think that side is 1, 3, 5 and 7? 1 and 7 were a nice grey-ish colour and 3 and 5 were black. Possible miss fires on 3 and 5 that cleared up with the leads/plug check and the excess fuel then burnt off and turned them black on the second start up? Or, any other ideas? Kind of reluctant to start it up again until I get the fire extinguisher refilled! As I was reversing and about to change back to D something happened to my gear lever. The pull button that lets it move went slack, the lever is stuck in the R position and I can't select any gears! Any ideas other than calling the RAC?